In an exciting if suspicious announcement today, Comcast, everybody's least favorite company, just told an audience at CES that it would start offering home customers gigabit internet speeds in 2015. That's this year! And, well, we'll believe it when we see it. The Comcast exec's announcement came in conjunction with a Broadcom event showcasing the new DOCSIS 3.1 chip which enables speeds of up to 2 gigabits per second. Both Comcast and Liberty Global were there to support Broadcom's new technology, and Comcast sort of stole the show. "DOCSIS 3.1 is a critical technology for Comcast to provide even faster, more reliable data speeds and features such as IP video to our subscribers' homes by harnessing more spectrum in the downstream," Comcast's Tony Werner said in a statement. "By more effectively using our cable plant to grow our total throughput, we expect to offer our customers more than 1 gigabit speeds in their homes in 2015 and beyond." That would be a huge improvement, since Comcast's current "Extreme" plan only offers speeds up to 150 megabits per second. 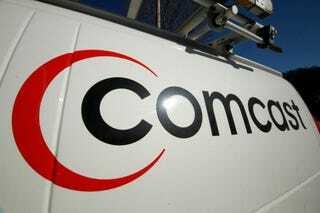 It remains unclear exactly how many customers would get Comcast's new headline-grabbing gigabit offering. Comcast has been dangling the possibility of offering these speeds for a while. A couple years ago, it showcased the ability to achieve 3 Gb/s speeds on its network and announced last year that some of its customers would enjoy all fiber networks. It even trademarked a catchy name for a new service: "True Gig."